Try Bold 3in1 PODs: 1. Cleans 2. Freshens 3. Softens. There’s nothing like this Bold Washing Capsules to feel the pampering, relaxing feeling of a spa and that relaxing feeling of bathing salts between your toes. The scent of this variant will make you feel like a million bucks. Take your senses on a relaxing stroll through fragrant fields of fresh Lavender and let your cares melt away. This timeless scent blends soothing Camomile, Warm Woods and soothing Manuka Honey notes for a blissful feeling of serenity and harmony. Bold Washing Capsules gets to work right at the heart of the wash. 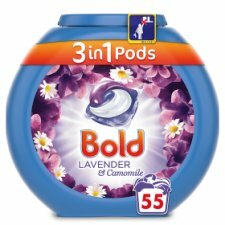 Bold 3in1 Pods Lavender & Camomile was created to work in perfect harmony with Lenor Lavender & Camomile Fabric softner, use them together for the perfect laundry routine. WARNING! This product may be harmful and could cause serious injuries. Keep Bold pods out of reach of children. Visit www.keepcapsfromkids.eu for more information. Causes serious eye damage. Causes skin irritation. Harmful to aquatic life with long lasting effects. Keep out of reach of children. IF IN EYES: Rinse cautiously with water for several minutes. Remove contact lenses, if present and easy to do. Continue rinsing. IF ON SKIN: Wash with plenty of water. IF SWALLOWED: Rinse mouth. Do NOT induce vomiting. Immediately call a POISON CENTER/doctor. Contains MEA-C10-13 Alkyl Benzenesulfonate; MEA-Laureth Sulphate; C12-14 Pareth-7. Contains Linalool. May produce an allergic reaction.